High-Definition Recreated Hand-Drawn Visuals Throughout. Authentically Disney with Original Voice-Overs and Classic TV Show-Inspired Backgrounds. Swim in Scrooge McDuck's Money Bin for the First Time and Track Your Earnings! 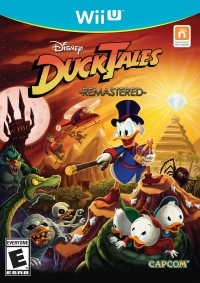 Embark on an authentic Disney adventure, as Scrooge McDuck and his three nephews, Huey, Dewey, and Louie travel to exotic locations throughout the world in their quest to retrieve the five legendary treasures. 12-28-2014 pacpix Box Text THE QUACK IS BACK High-Definition Recreated Hand-Drawn Visuals Throughout. Authentically Disney with Original Voice-Overs and Classic TV Show-Inspired Backgrounds. Swim in Scrooge McDuck's Money Bin for the First Time and Track Your Earnings! Embark on an authentic Disney adventure, as Scrooge McDuck and his three nephews, Huey, Dewey, and Louie travel to exotic locations throughout the world in their quest to retrieve the five legendary treasures. 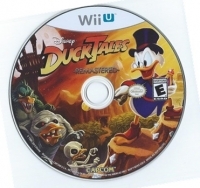 This is a list of VGCollect users who have Disney DuckTales Remastered in their Collection. 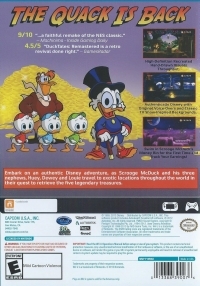 This is a list of VGCollect users who have Disney DuckTales Remastered in their Sell List. This is a list of VGCollect users who have Disney DuckTales Remastered in their Wish List.